Colin Chapman's famous catchphrase — "simplify, then add lightness" — referred to his philosophy of making his Lotus road and race cars faster by removing weight rather than adding power. I can't help but think Nissan drew inspiration from Chapman's ideals when the company distilled the 2018 Kicks into a simple, spacious, no-frills crossover that undercuts and outperforms its competitors in key ways. And the competition is fierce: The Hyundai Kona, Jeep Renegade, Honda HR-V, Toyota C-HR, Kia Soul, and Ford EcoSport are all about the same size. Compared with those, the Kicks is right in the middle in terms of length (169.1 inches), features a slightly longer wheelbase (103.1 inches compared with its competition's 102.3 average), with a width (69.3 inches) that's slightly narrower than those rivals, and a height (62.4 inches) that's the second shortest. Compared to the Juke it replaces, the Kicks is longer, thinner, and just about the same in terms of height. But where Chapman's adage applies is the Kicks' power-to-weight ratio. Despite its raw horsepower figures trailing the rest of the CUV litter — the Kicks' 1.6-liter 16-valve four-cylinder engine is rated at just 125 horsepower and 115 lb-ft of torque — highway merging isn't much of a problem. The Kicks weighs just 2,639 pounds, which is between 300 and 700 pounds lighter than the outgoing Juke depending on trim level. This gives it a power-to-weight ratio equivalent to its more powerful, yet heavier, adversaries. 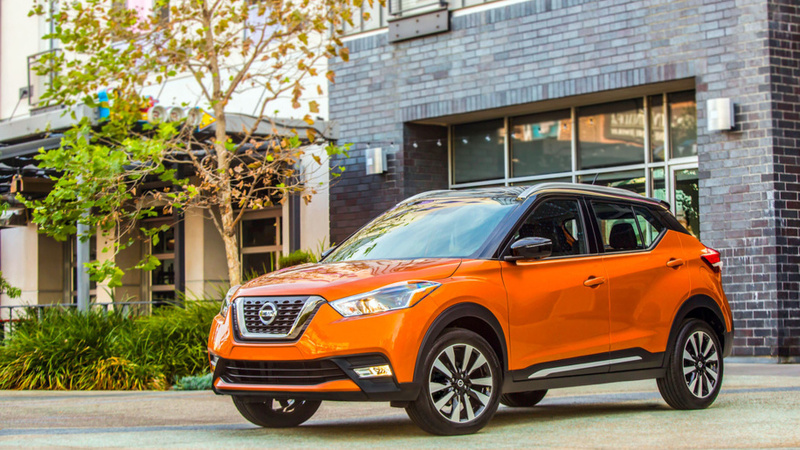 Nissan today announced a ,990 starting price for the all-new 2018 Nissan Kicks, which goes on sale later this spring at Nissan dealerships nationwide. Each of the Kicks' horsepower pulls just 21 lbs, compared to, for example, the Soul's 24 lbs. 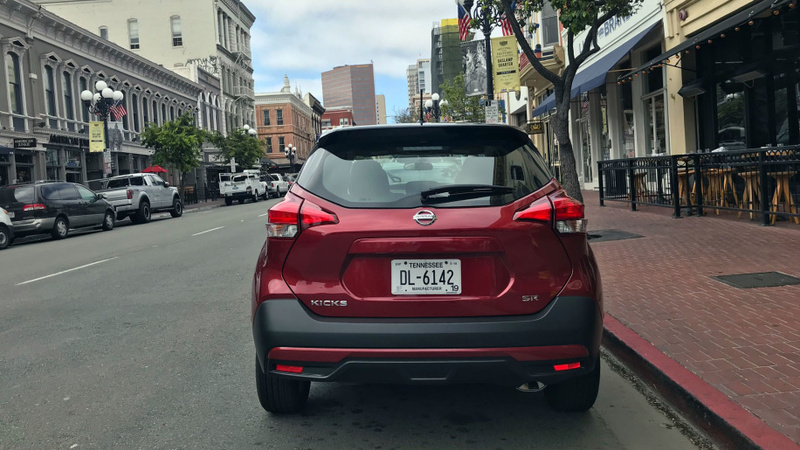 Its relatively light structure means that it can also return a frugal, and best in class, 31 mpg in the city, 36 mpg on the highway, and a combined 33 mpg — compare this to C-HR (29 combined), Kona (30 combined), Soul (27 combined), HR-V (31 combined), Renegade (26 combined), and EcoSport (28 combined). Driven enthusiastically through some choice canyon roads, I struggled to get less than 31 mpg average, which is an impressive feat. The little engine is harnessed to Nissan's Xtronic Continuously Variable Transmission (CVT), and though smooth in its power delivery, it drones annoyingly when putting your foot down while getting onto the highway. While it's nice to know that the Kicks is light enough to make do with its comparatively meager horsepower, buyers who are actually going to haul people and stuff in the Kicks will also be curious about its interior dimensions. There's good news: Despite its below-average weight, the interior measurements are all above average, including head room (40.7/38.5 inches front and rear), leg room (43.7/33.2 inches front and rear), and the largest cargo space of all (25.3 cubic feet). Nissan today announced a ,990 starting price for the all-new 2018 Nissan Kicks, which goes on sale later this spring at Nissan dealerships nationwide.Nissan today announced a ,990 starting price for the all-new 2018 Nissan Kicks, which goes on sale later this spring at Nissan dealerships nationwide.The all-new 2018 Nissan Kicks, the newest entry in the fast-growing affordable compact crossover market, made its North American debut today at the Los Angeles Auto Show.Nissan today announced a ,990 starting price for the all-new 2018 Nissan Kicks, which goes on sale later this spring at Nissan dealerships nationwide. This is thanks to Nissan's engineers simplifying the interior dimensions, design, and materials in order to give passengers extra room and comfort. The cabin itself is fairly spartan; the surfaces feel as if Nissan's engineers came in with a razor and shaved everything down to provide more room. Door cards are hard plastic, but the parts that you routinely touch are smooth. The instrument cluster is composed of one analog speedometer and one TFT display that can be configured to display the tachometer, trip odometer, fuel consumption and range, and a handful of other commands. The dash, which features a central touchscreen (which is CarPlay- and Android Auto-capable on all models aside from the base), and a tidy HVAC control unit, feels as if it's been pushed toward the firewall to give drivers of taller stature more leg room. Farther down, the transmission tunnel separating the two front seats, which are both manually operated, is thin and only features the shifter and a manual parking brake. In back, it's just a bench seat. Though the interior is bereft of what many would consider modern-day necessities — leather door inserts, a 20-way HVAC system, head-up display, etc. — it isn't completely austere inside. 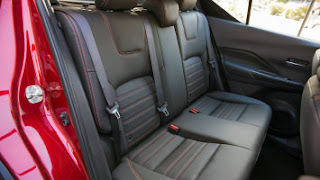 The front seats, which can be optioned with a faux leather called Prima-Tex, as well as a heating element, are roomy and, throughout our drive route at least, never caused tiring or soreness. The seats, however, are not as good as, say, the HR-V or CX-3. Both of those crossovers feature comfort that you'd expect more in a premium luxury sedan than a bargain crossover, but the seat material and foam of the Kicks feels better than the class average. The back seats have ample space and can fit full-grown humans, unlike some of the Kicks' competition; i.e. C-HR, EcoSport, and Kona. Nissan has finally updated the company's steering wheel design — the previous design was seemingly used in every Nissan product around for years, and looked dated. The new wheel is simpler, reflecting the exterior aesthetic. The Kicks replaces Nissan's long-struggling Juke. For consumers and critics, the Juke's styling was its main drawback and resulted in ever-decreasing sales. The Kicks' exterior, however, is meant to more closely resemble the design language and overall proportions of Nissan's best-selling Rogue, Murano, and Pathfinder. And indeed, the exterior is a much more conservative — and pleasing and cohesive — design than the outré Juke, although it still has a kick of flair in the form of its two-tone floating roof. The redesigned front also maximizes aerodynamics, providing better fuel economy and making the car quieter — inside the cabin, the Kicks is remarkably free of wind noise. Underneath the Kicks' new body is a platform shared with Nissan's compact Versa sedan. At the front are independent struts and shocks, while at the back is a twist-beam rear suspension with twin-tube shocks. On the road, it's not as fun to toss around as the nimble Mazda CX-3, which is the best-handling vehicle in the segment. The Kicks rides like a slightly lifted Versa: compliant enough on a straight road, but there's significant body roll in a turn, and not much feedback is provided to the driver. The Kicks makes do with rear drums. Despite the archaic setup, it has plenty of stopping power, with great initial bite and a reassuring pedal feel. Furthermore, the Kicks comes standard with Automatic Emergency Braking, the only vehicle to do so in its segment. Steering is electrically controlled, and it provides adequate sensation through the wheel. As you would expect, as speeds increase, the resistance from the wheel increases. At highway speeds, the steering feel is heavier than it needs to be. What you can't get on the Kicks, but what the HR-V, Kona, and Renegade offer, is all-wheel drive. Front-wheel drive is enough for most drivers, if they fit adequate tires for the season and conditions. The Kicks is sure-footed enough that those drivers won't miss the extra driven wheels. But where the Nissan Kicks seals the deal, at least to this audiophile, is its Bose stereo system. Called Bose Personal Plus, the system uses just eight speakers, of which two are 2.5-inch UltraNearfield neodymium speakers set into the driver's headrest. The effect of these strategically placed speakers is an unrivaled soundstage. It does so much with so little. The bass hits you in the chest, while the treble and mid sections give a clarity that'll send chills down your spine. The $1,000 Nissan charges (the option also nets you the Prima-Tex fabric and heated seats, as well as a security system) is a bargain, full stop. The Kicks keeps things simple — and that's a high compliment. It's a great commuter, with a comfortable and quiet interior, compliant ride, great gas mileage, loads of cargo space, and adequate performance for your everyday needs. And, with a starting price of $18,965, only the Kia Soul undercuts it at a starting point of $17,095. Fully equipped, it barely tops $22,000, while the C-HR, HR-V, Renegade, and EcoSport all max out in the upper $20,000 range — and in the case of the Soul, almost breaks the $30,000 barrier. The lightweight philosophy, a loose but successful interpretation of Chapman's mantra, also means the 2018 Kicks does more with less. Considering the entire package, it's our new favorite bargain in the compact crossover segment.